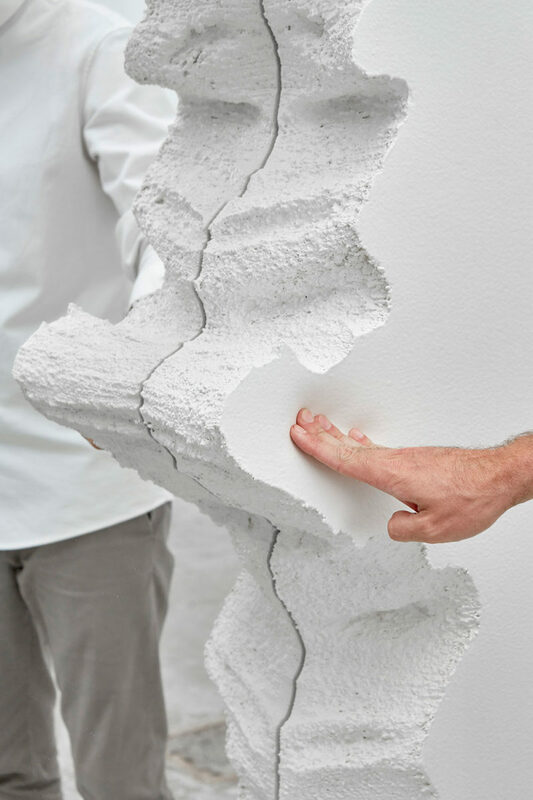 Embodying their field’s experiential nature, the trio behind Snarkitecture strives to merge monochromatic aesthetics and a keenness to encourage personal, meaningful, and tactile encounters. Against the striking backdrop of their New York studio, two of the firm’s three partners let us in on their idea of intersecting art and architecture. Snarkitecture’s home for the last two years has been situated in Queens, a 550-square meter space amongst the gleaming new structures of the recent Long Island City redevelopment. The light-filled and airy space has ceilings that seem to stretch as high as the East River outside is wide, and contains the signifiers you might expect to find in the working environment of a thriving, relatively young architectural company. The furniture is all flash-of-steel and gleam-of-white; functional, grey office equipment is shrouded in vibrant green plant life. It is refined utilitarianism, synced to a team who are responsible for some of the most arresting projects to grace the spheres of architecture, fashion, retail, and more over the past decade. And yet, there’s even more to the space. 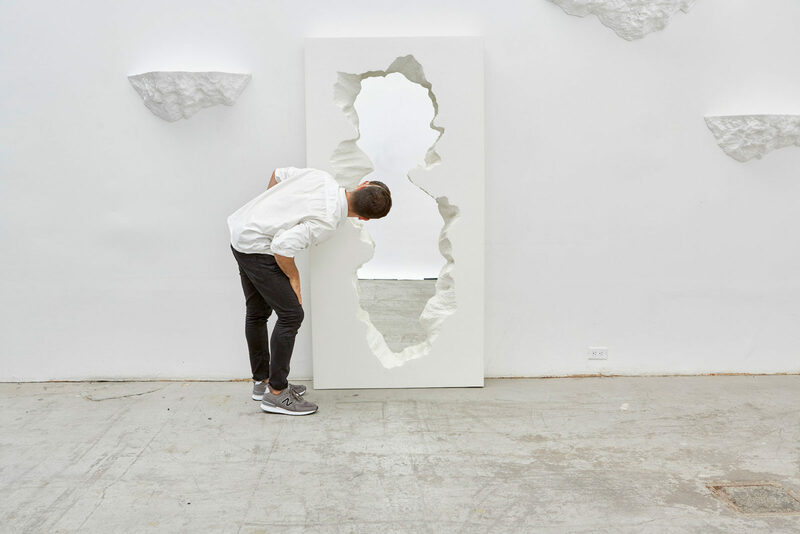 This is nothing so simple as an office for architects—it is an office for Snarkitecture, the practice founded in 2008 by Daniel Arsham and Alex Mustonen, friends and fellow graduates of The Cooper Union University in New York’s East Village. Mustonen studied architecture while Arsham studied art, and the two joined forces to explore the intriguing liminal space that exists between the two disciplines. 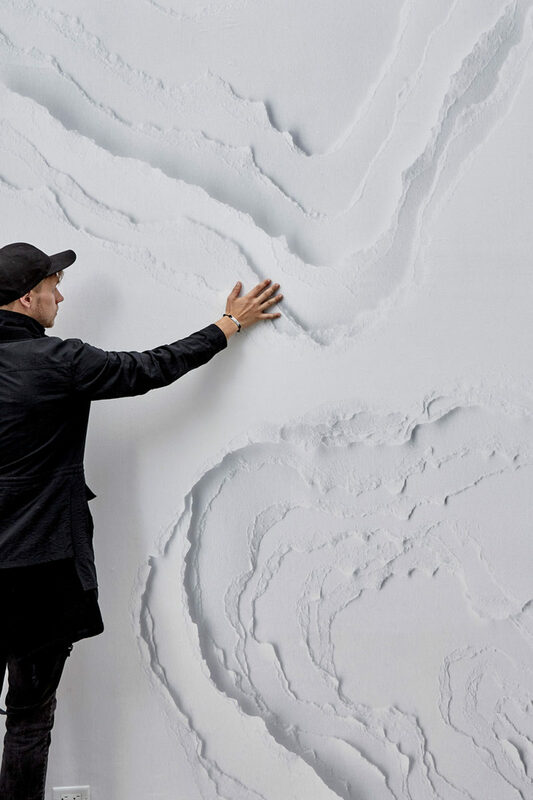 Designed with a monochromatic palette, Snarkitecture’s works openly invite people to touch them. That yin and yang is naturally expressed in the space: A ping-pong table, that perennial staple of start-up-culture comfort, is moulded from concrete in the signature Snarkitecture style; smooth and gleaming on the surface, it is dripping with earthy imperfection across the underside. Directly behind the table is a rippling white wall featuring a bleached-out inverse of a geographical topography. This showpiece sinks into the wall while all around it others burst forth: a disembodied grey arm; three-dimensional outlines of trapped human(oid) figures in blistering, brilliant white. Han Solo, frozen in carbonite; Laura Palmer, wrapped in plastic. 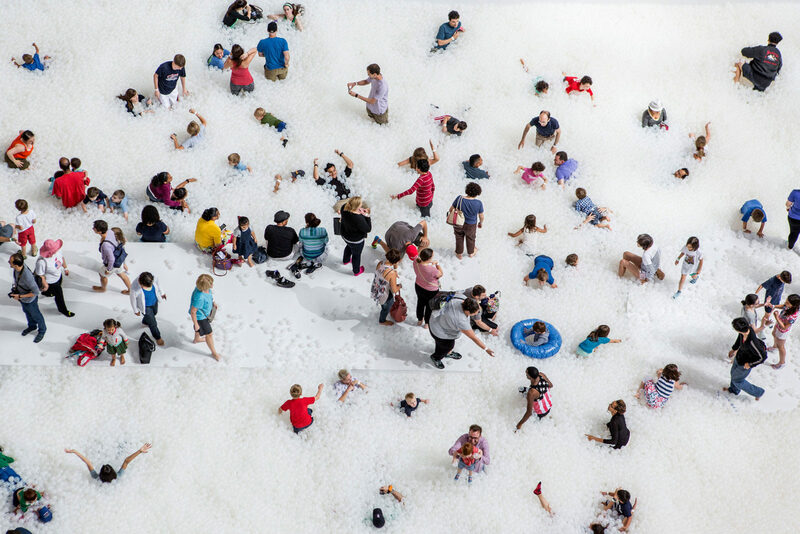 Additionally, the space also features more recognizable remnants from Snarkitecture’s output over the years, such as a concrete vat of clear plastic spheres. These recyclable and antimicrobial balls are a fraction of the one million that the practice gathered for their 2015 installation, The Beach. Initially commissioned by the National Building Museum in Washington D.C., the project exemplifies both the monochromatic aesthetic of the practice and the recurring desire amongst its founders to encourage truly immersive experiences. “Making spaces that are playful and engaging to a wide audience are certainly goals of the practice,” says Mustonen. “Unless it has a specific function—a cafe has to work as a cafe and a shop has to work as a shop, for example—there’s no prescribed means as to how anyone should engage with something we’ve created. With something like The Beach, we’re calling to mind a summer’s day outing, but in a completely different context.” This immersive nature manifests itself quite literally in The Beach. 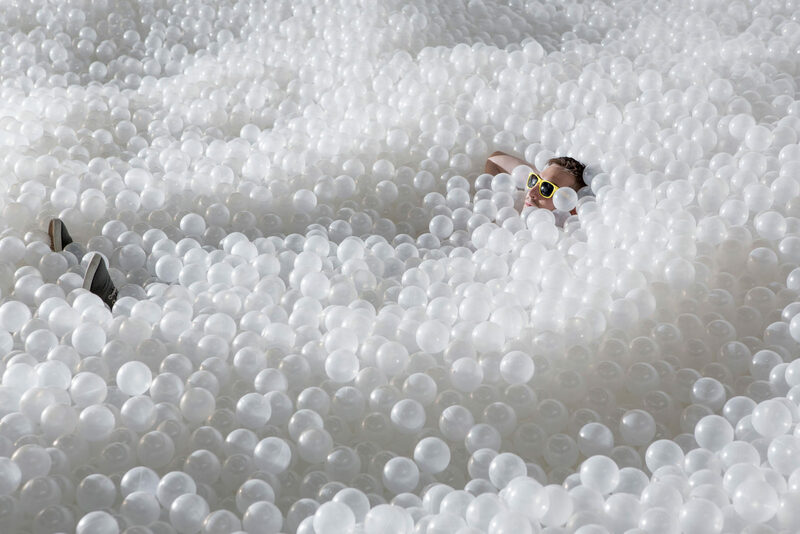 As the numerous images that inevitably disseminate from an installation such as this show, visitors would find themselves sinking into the vast—think football pitch-size—pool of plastic balls, an unavoidable grin spreading across their faces as they half float, half disappear into the mass. A fraction of the one million balls that the practice gathered for their 2015 installation, The Beach, are recyclable and antimicrobial, and remain on site of the studio. On Snarkitecture’s horizon lies a project that looks to bring their work to even more people, by first bringing it all together. Following on the heels of a monograph with Phaidon, comes Fun House: the practice’s first comprehensive museum exhibition that opens this summer at the National Building Museum. The centerpiece of the show, both in concept and physical construction, is a ‘house’ in which each surrealistic room will feature past Snarkitecture projects—not simply a retrospective, but also a playful hint at a direction Snarkitecture would perhaps like to head in their practice. “We’ve never really worked in the residential space, but I think it could be a very interesting commission for us,” says Mustonen. For now though, today, the studio thrums with people envisioning and executing projects big and small. Snarkitecture may be a long way from its humble beginnings—“two guys, sitting in an empty room with two desks,” as Mustonen remembers it—but the core principles, the tensions of those in-between spaces in which Snarkitecture thrives the most, still remain: precision and looseness; impulse and dialogue; everyday objects and unrecognizable applications. Ultimately, there is a subtle egalitarian idealism ingrained in that reduced white palette. Just like the absurdist Lewis Carroll poem from which the practice takes its name: No matter how dazzling their journey becomes, at heart there remains a simple search for happiness. 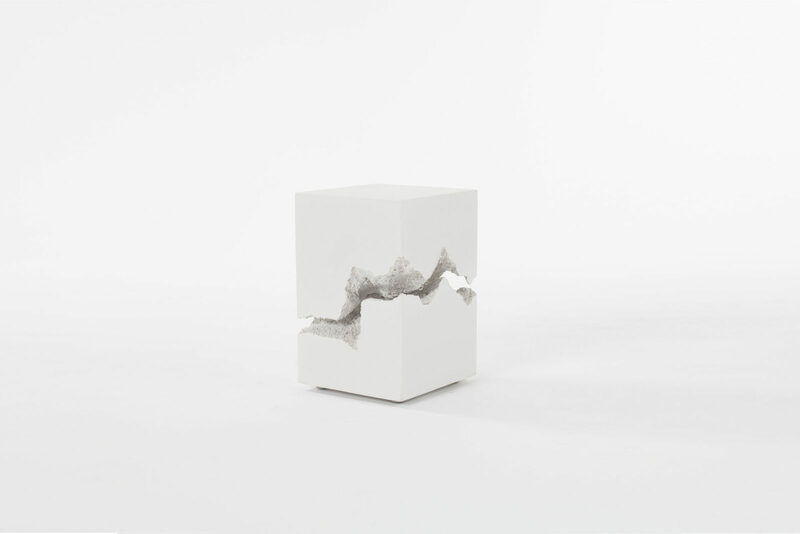 Eager to make architecture more accessible, the founders of Snarkitecture continuously challenge conventions related to art and spatial realities. To experience their interdisciplinary practice first-hand or immerse yourself in their thinking processes, visit the firm’s website or follow them on Instagram. 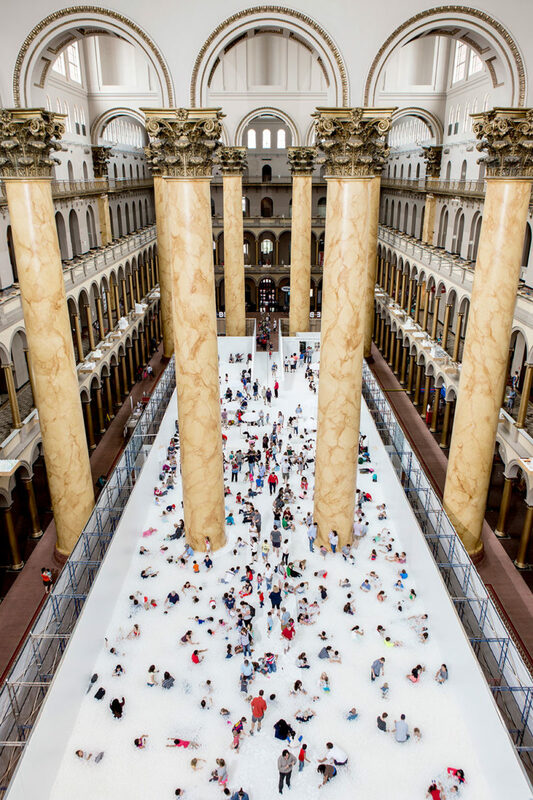 This summer, Snarkitecture’s signature design and practice will take centerstage at The National Building Museum’s Summer Block Party exhibition in Washington, D.C..